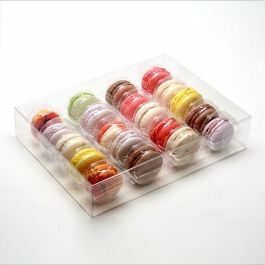 Each Clear French Macaron Tray Insert holds up to 25 cookies. Two inserts combined serve as a bottom tray and a top cover to hold 25. 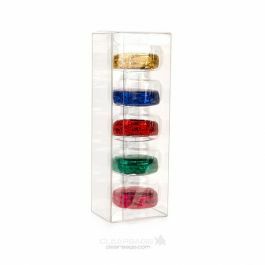 Placed together, these trays provide a vivid display and protection of your cookies. The individual cookie inner pocket dimension of the insert is 1 1/8" x 1 15/16." Rows of 5 are perforated for easy separation. These are trays/covers only. Outer boxes or bags are sold separately, or you can buy both as a set. Stickers are included, to purchase additional stickers click here to see our full list of sticker options. 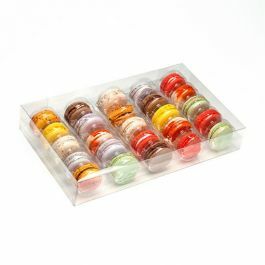 Our 12 5/8" x 7 3/8" French Macaron Tray Insert come in a pack of 10 pieces. 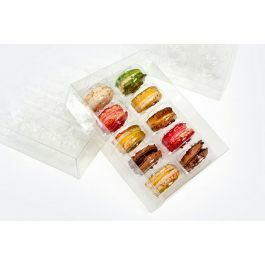 These 10 inserts can hold up to 125 cookies and can break down into 25 rows of 5 macarons. The trays will hold 250 if the inserts are used as bottom trays only. To streamline the packaging process, our inserts our perforated to make the separation of the plastic easy and fast to hold rows of just 5, 10, 15, 20 or 25 cookies. Outer boxes or bags are sold separately or can be purchased as a set. Keeps your cookies fresh. Outer Dimensions: 12 5/8" x 7 3/8"
Inner pocket dimensions of insert: 1 1/8" x 1 15/16"
The most popular use is for displaying French Macarons, chocolate dipped cookies, and mini donuts. Each tray holds up to 25 cookies.